You are doing it wrong! You are supposed to wait until AFTER a game is lauded as a bona fide classic before you get its iconography indelibly etched into your flesh. Sure, Fallout 3 is looking good and all signs point to it being a decent game.. but you have know that somewhere there is a sheepish body art fan walking around hiding his Too Human inkage under a heavy wool shirt. 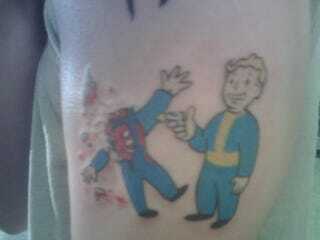 Reader David Lo sent in some snaps of what we assume is his actual arm, now forever marked with a colorful rendition of Vault Boy cheerily gibbing someone with a handgun. It is nice work, but.. well, we hope it works out for you, mate.